I'm Safe has I'm Safe! On My Bike theme materials in the form of color comic-style activity books, sticker books, award certificates, banners, bookmarks, crayons, bike tatoos, a DVD, goodie bags, paint sheets, posters, teacher kits and more. Some are also available in Spanish or a bilingual version. Costs start at about $1.67 each for the activity books including shipping, with a 50 book minimum order. We have not seen their books so don't know if they are well written or not. 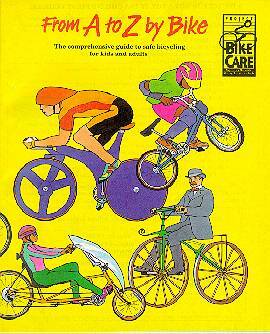 AMC Media has a nice comic book-style safety booklet called "From A to Z by Bike." It was sponsored by NHTSA/DOT and the Wisconsin Department of Transportation. It is colorful, well done, has helmets on everybody except a Draysienne rider from the 1800's on the cover (he has a hat) and some riders on the "What's wrong with this picture" page. The comic runs through the alphabet of bike safety in 31 pages. Prices drop with larger quantities. Twenty are $1.55 with shipping, but 100 would be 95 cents each. Available from AMC Media, PMB 729, 250 "H" Street, Blaine, WA 98230. Phone (in Vancouver) is 1-800-667-6119 or 604-736-6931.